at Stamp Anniething!!! HAPPY HALLOWEEN!!!! Stitched Square Dies for the bottom layers. 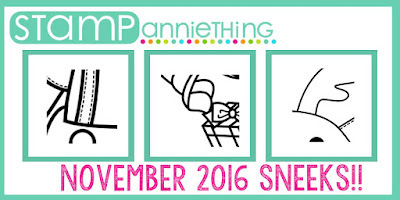 SNEAK PEEKS starts this Wednesday!!! Hello! 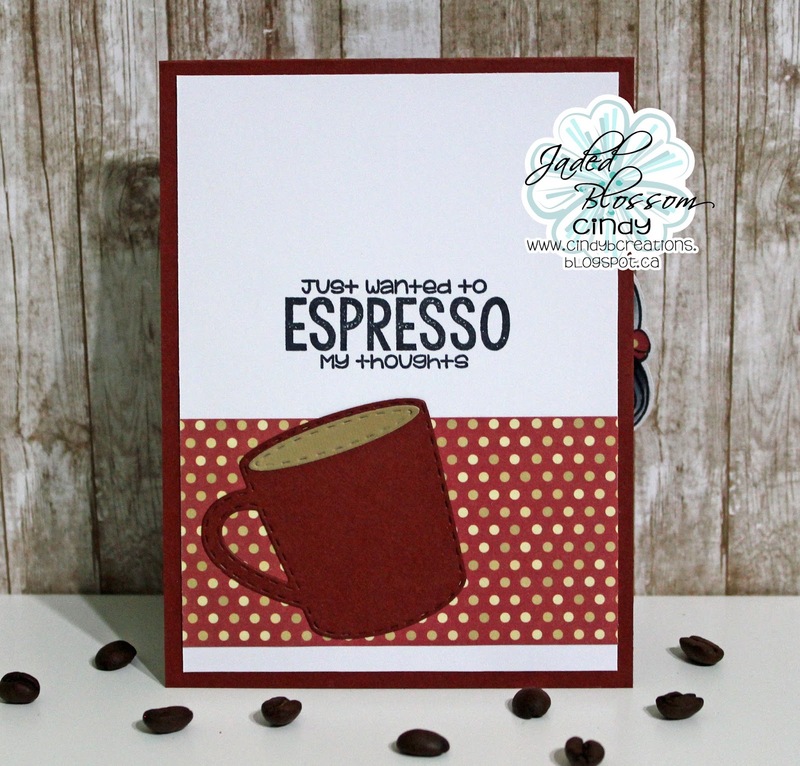 Mel from Doxie Mel Designs with a Theme Week Card for you. To play along with the challenge create with the colors: Orange, Purple and Green. 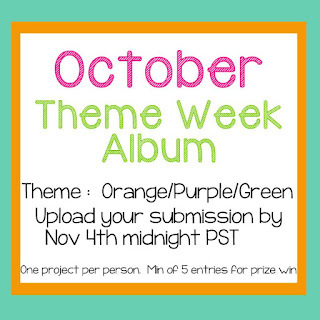 We would love for you to participate with us in our THEME WEEK and it's quite easy to do so! 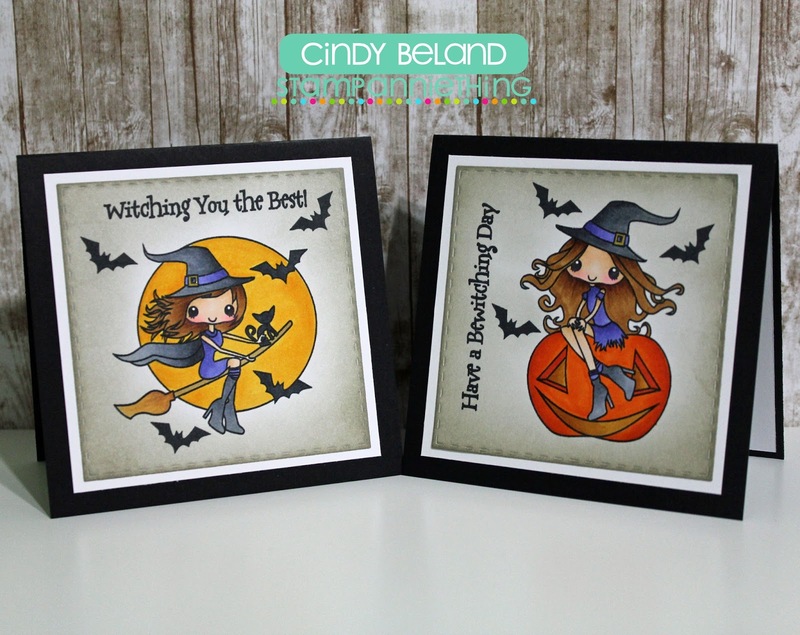 Simply create a project using ANY Stamp Anniething product (as your main focal point) in the set "theme" for that month. 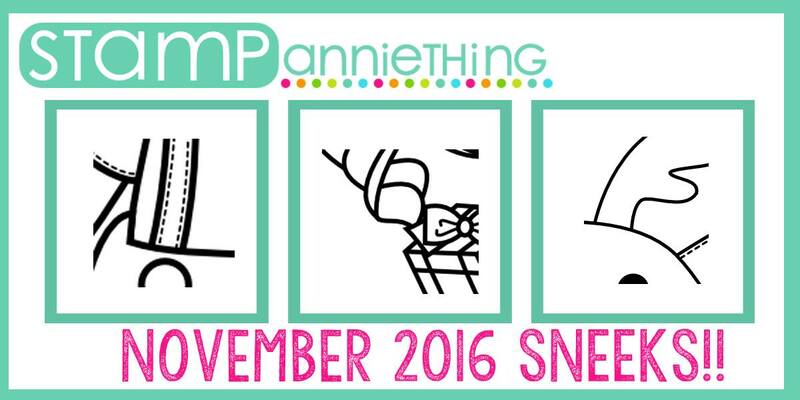 Post your project by November 4 to the corresponding album over at our Face Book Group page (Stamp Anniething Stampers)! You may enter as many projects as you wish, but you will only be counted as ONE entry person. A minimum of 5 people (not including DT Members) is needed in order for a prize to be given. 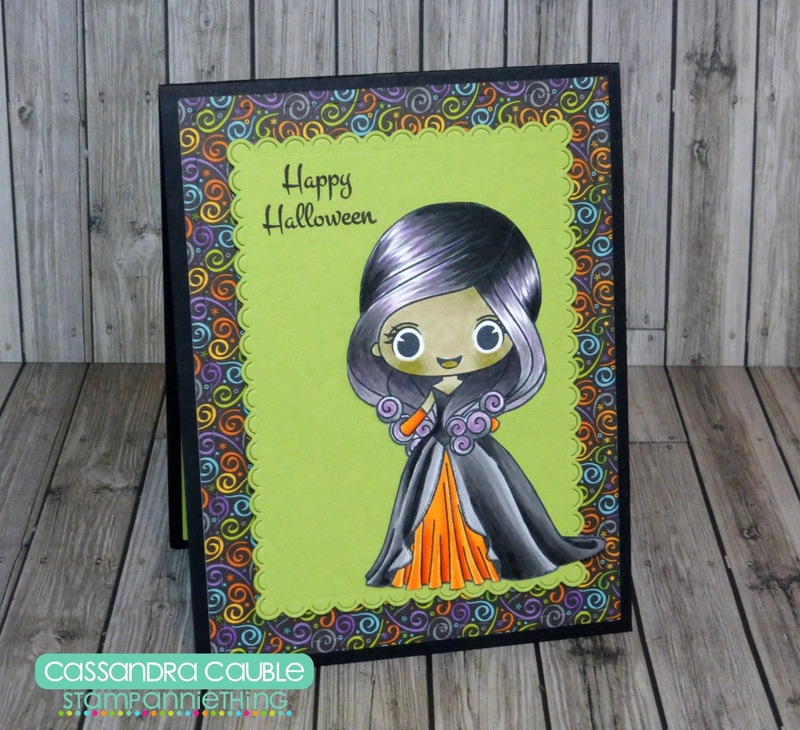 I love Orange, Purple and Green for Halloween. I thought it would be fun to use these colors for an all occasion card. The hula hoop girl, Abigail - You're Fun is colored with Copic Markers. 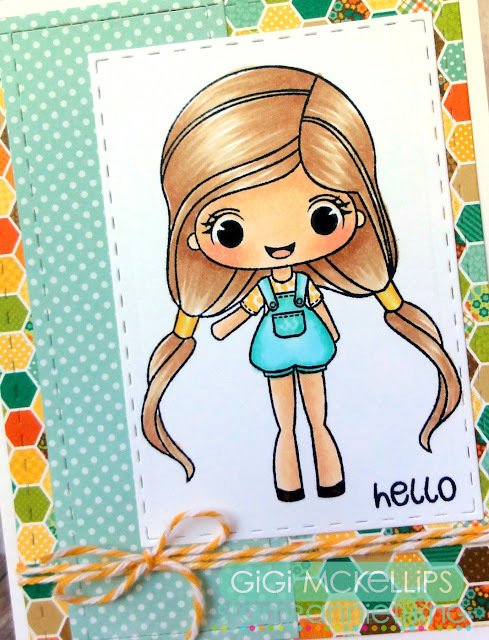 I added brown colored pencils to her hair too. Hope to see your project at the challenge! Orange - Purple - Green. Make ANY project with orange, purple and green. 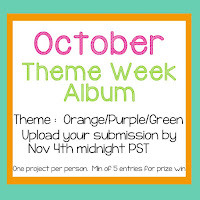 All projects must be uploaded by midnight PST November 4th to qualify. Here's my beautiful Halloween ghoul! This is the Stamp Anniething ~ Giselle : For A Princess. 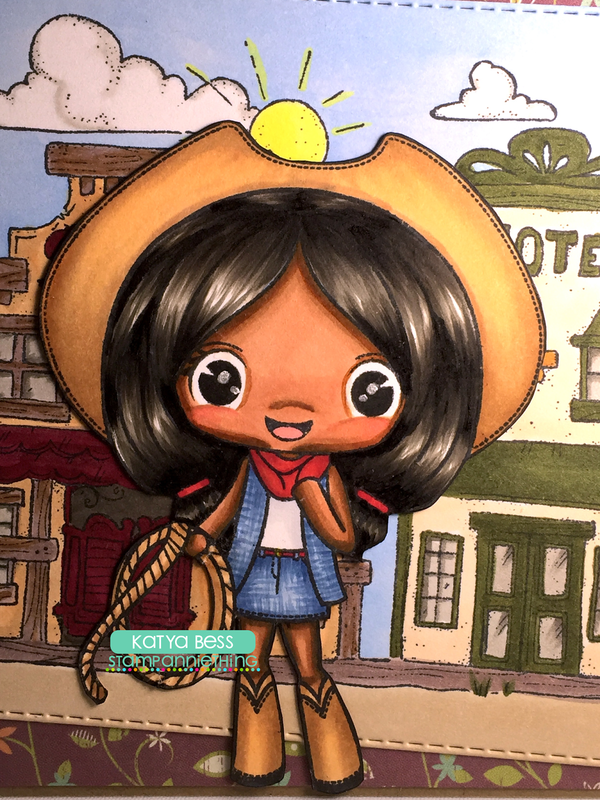 I colored her in with Copic Sketch Markers. 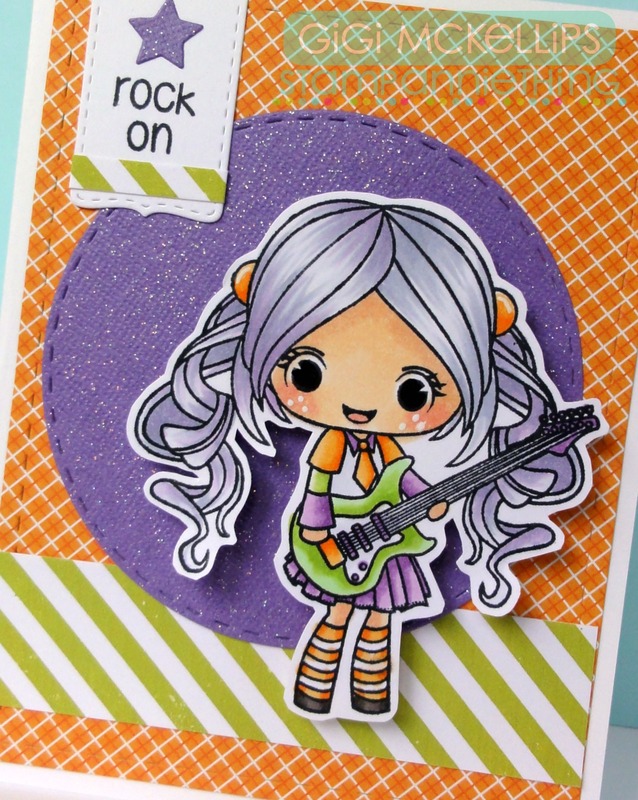 I cut the swirly background using the Jaded Blossom ~ Card Mat Dies. 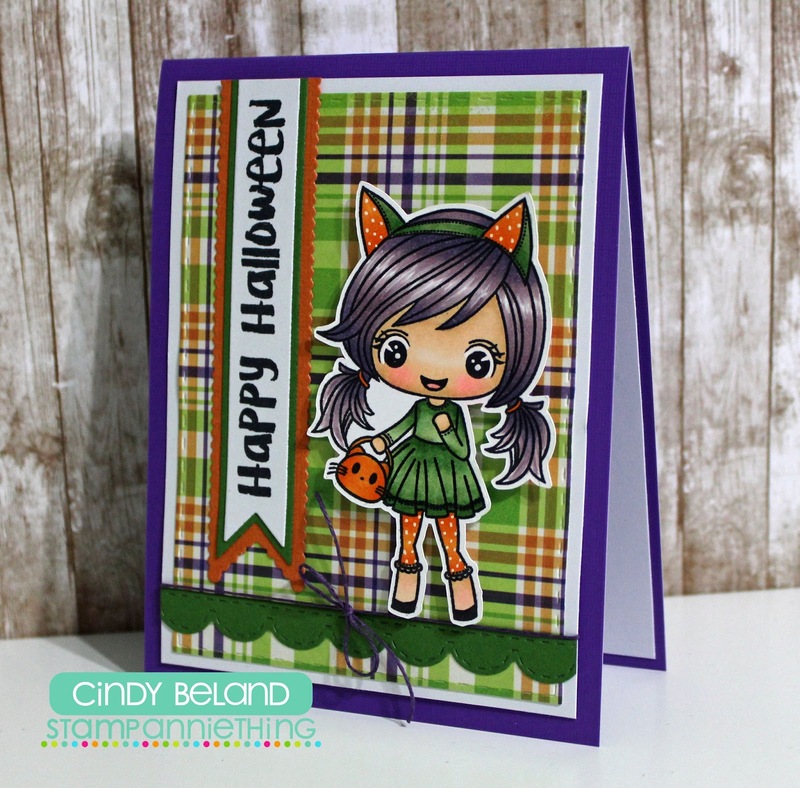 The green piece is cut using the Jaded Blossom ~ Scallop Rectangle Dies 2. And the sentiment is from the Jaded Blossom ~ Halloween Treats. Well my creative friends, that's it for me today. I hope you join our Challenge this month! I can't wait to see what you all make. Have a great day everyone! I will see you all again soon. 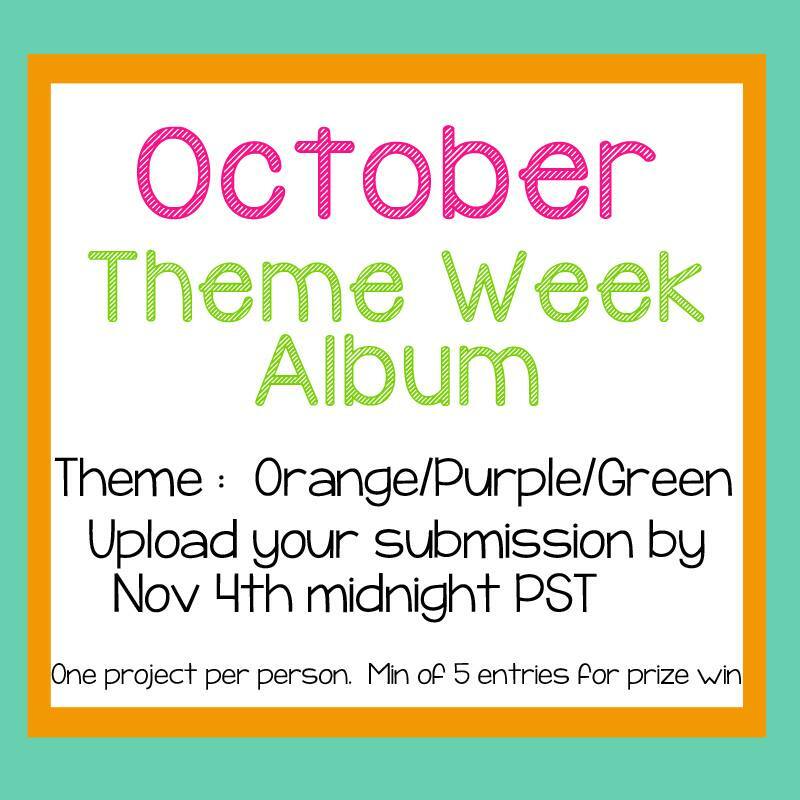 October Theme Week - Day #3! 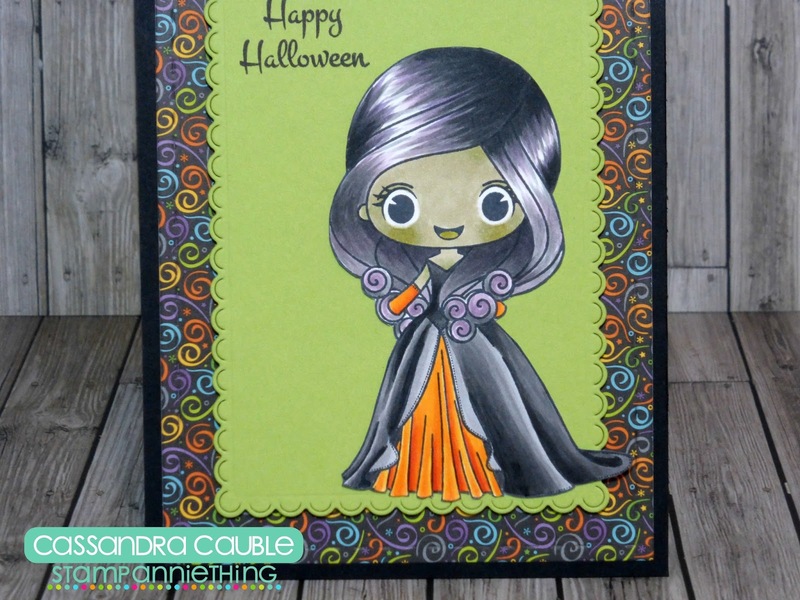 Make ANY project with Orange, Purple, and Green colors! 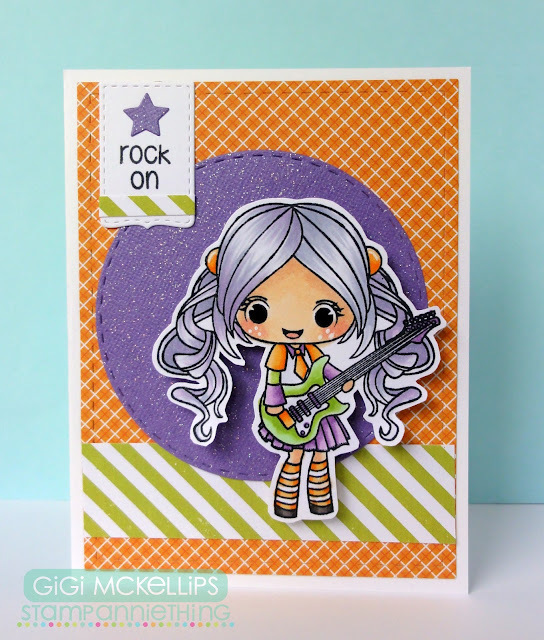 I used the Tess- Rock On stamp set for my Theme Week card. I added a circle to the background cut with the Stitched Circle Dies and strips of green stripe paper to the card base as well as the sentiment tag. I stamped and colored Tess with Copic Markers and pop dotted her to the card. To finish, I cut the sentiment tag using the Candy Charms and Banner Dies, added a star cut from the Star Dies, and stamped the sentiment. HALLOWEEN LABELS that was (September freebie) the Border Dies for the border. Hello and Happy Friday! Melissa from Doxie Mel Designs with you today on the Stamp Anniething Blog. I colored up the newest Lorraine stamp so she would have an "ugly sweater". Still looks kinda cute to me. :) The sentiment is from Jaded Blossom, Bah Humbug. The card front is cut with Lawn Fawn Dies, Scalloped and Stitched Rectangles. Wanna Sleep Over? By Guest DT Laura! 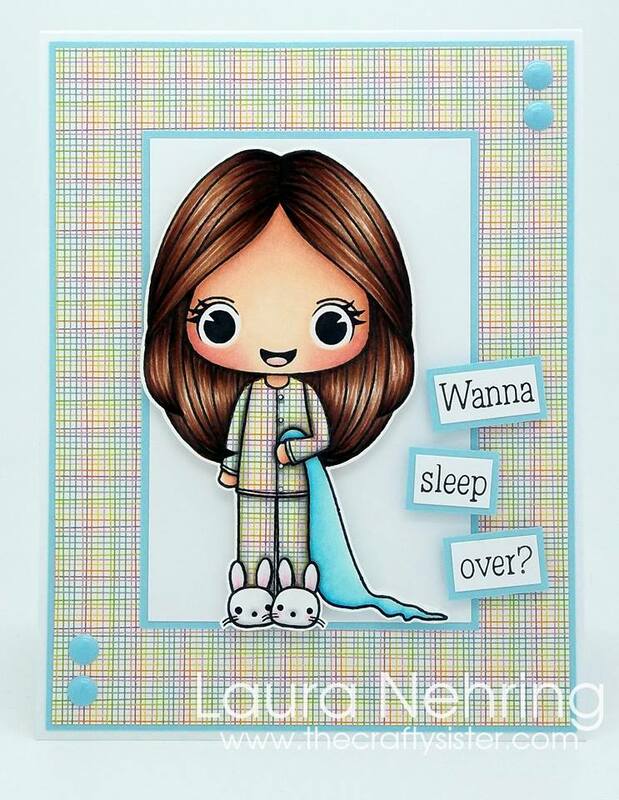 Here is a totally delightful and adorable card by Guest Designer Laura! 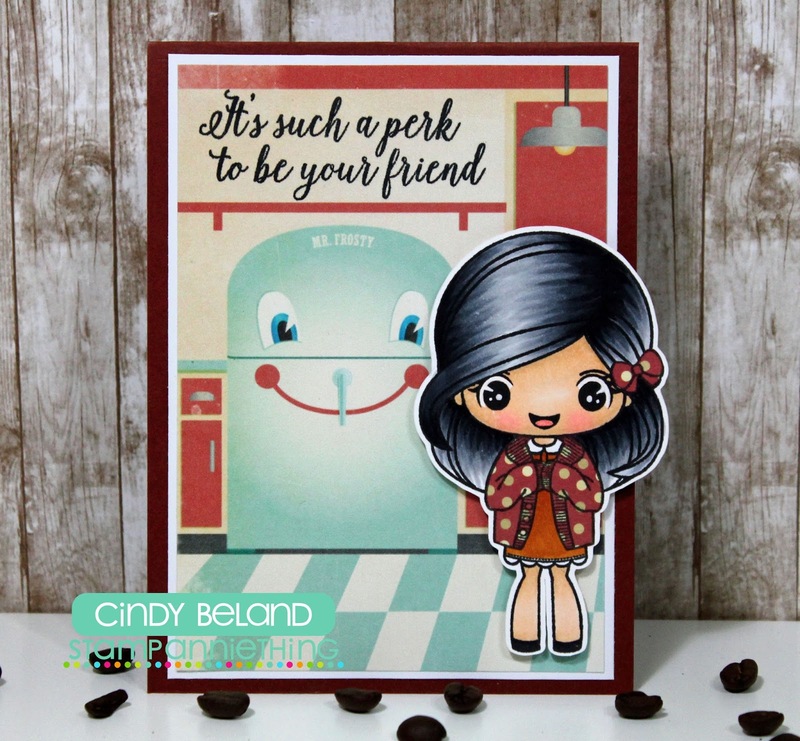 I used the Lorraine-Hello stamp set for my card. I stamped and colored Lorraine onto a mat cut with the Goody Bag Die and added it to the card. To finish, I stamped the sentiment onto the mat and added some twine. and the background paper is from my Imagine. 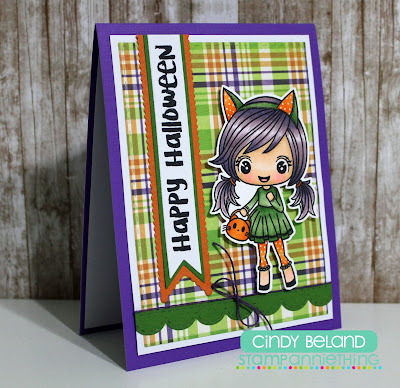 Today I made a 6x6 card using Holly - Cheer Up, she's a super cute little nurse. 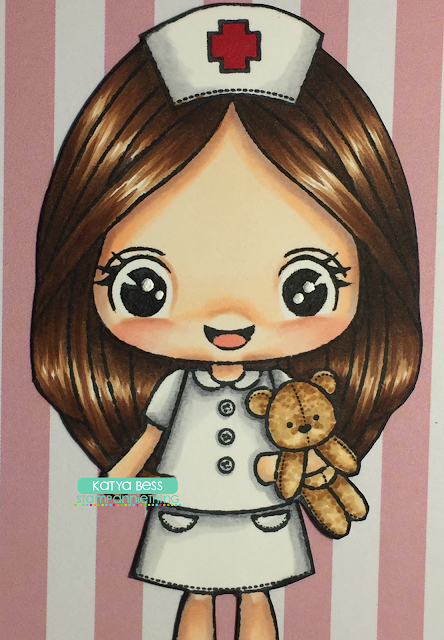 Actually, you can leave out her nurse hat and just color her as a little girl holding a Teddy Bear but this time I actually stamped and masked the hat so she can be a little nurse. The message "To a V.I.P... Very Important Patient" I just hand-wrote with my Sakura Pigma Sensei black pen. The Markers I used are Copic. and the paper I used to color is from Crafter's Companion. Hi! Mel from Doxie Mel Designs with a new card for a sweet friend. Who doesn't have a sweet friend? It is fun to have an all occasion card in your card stash. 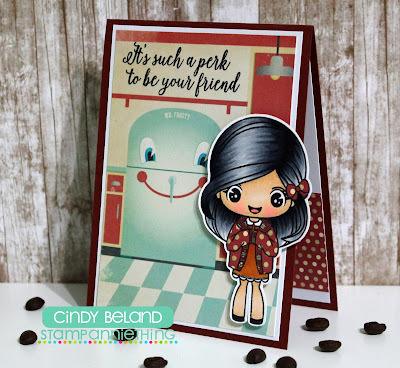 The image is one of then newest from Stamp Anniething, Diana - Sweater Weather. She is colored with Copic Markers. The dies and sentiments are from Jaded Blossom. I used the Tony-Gnarly stamp set for my card. 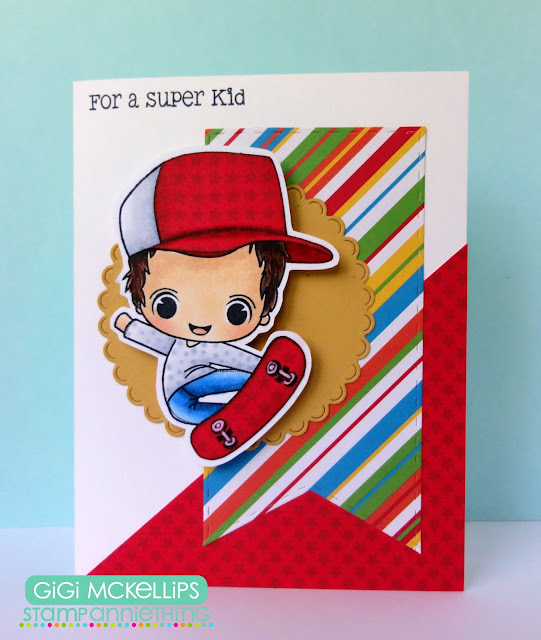 I started this card with a standard A2 card base and added a diagonal piece to the corner. I cut the pennant banner using the Jaded Blossom Wine Tag Dies and the circle using the Scallop Circle Dies. 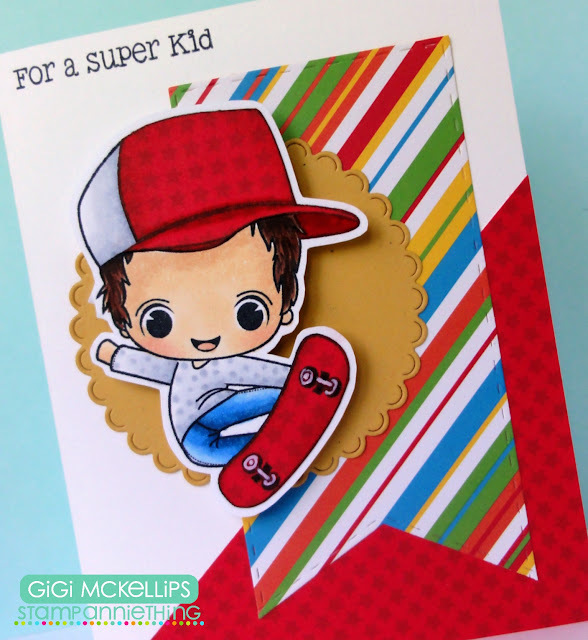 I stamped and colored Tony with Copic markers, paper piecing his hat and skateboard. I cut him out and pop dotted him to the center of the circle. To finish, I stamped the sentiment from the Super Hero stamp set. 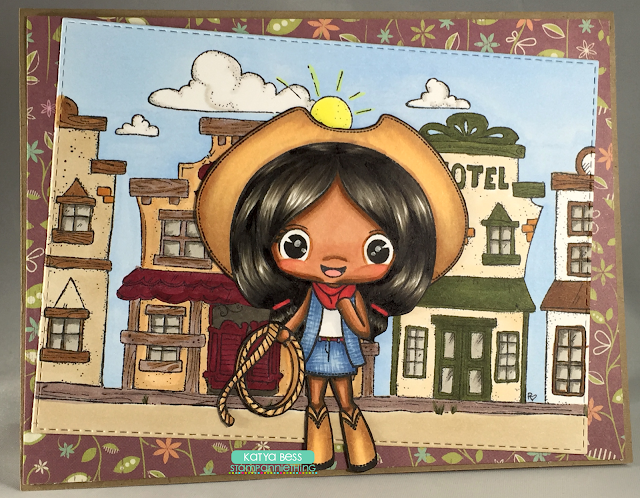 Today I'm sharing a card I made with Savannah - Howdy Partner and a Magnolia background stamp called Golden Creek.